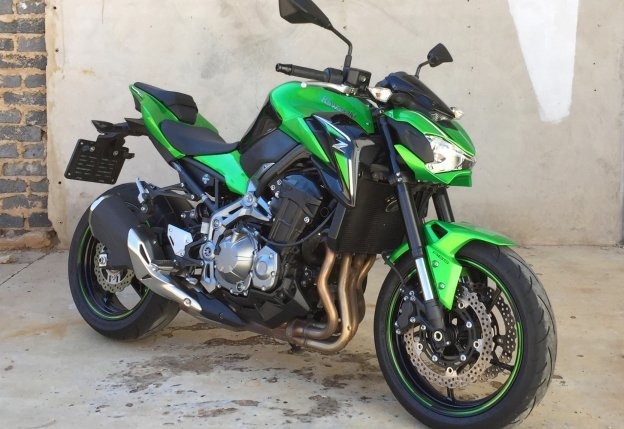 Johannesburg - With a purposeful, aggressive look, the current Z900 seems intent on earning the traditional “mean machine” appellation that generations of devoted Kawasaki fans have bestowed upon the products of the Japanese manufacturer, but does it have the punch to match the looks? I believe it does – the current Z900 may not be the gamechanger its early-70s namesake was, but it is a surprisingly quick, agile and competent all-rounder. Bar a few cubic centimetres, the Z900’s liquid-cooled, 16-valve dohc inline-four mill could have justified calling the bike the Z1000. Team Green say that the 948c engine has been tuned for “strong torque, and designed for mid-high range power”. Kawasaki also pointed out that the new airbox shape and staggered length intake funnels were derived from acoustic tests carried out in a sound room, so that they not only promote a broader torque spread, but to also produce an exciting intake sound. The motor may seem visually similar to its predecessors, but it now features five rigid mount points making it a stressed frame member. This change allowed a switch to a steel-tube trellis frame that's said to be substantially lighter than the cast alloy frame previously used. The frame, along with a lighter extruded aluminium swingarm and lighter wheels, is a big part of the claimed 21kg weight saving over the Z800. Although fairly devoid of most rider aids, the Z900 offers an assisted slipper clutch that has been developed based on feedback from Team Green’s World Superbike Racing program. The slipper clutch reduces tyre hopping and skidding that is usually caused by excessive engine braking. Being assisted, the clutch level is light enough that you can operate with one finger if needs be. Under normal commuting conditions, the light clutch lever became one of my favourite features of the bike. Braking duties are handled by 300mm petal rotors with dual-piston calipers on the front wheel and a 250mm petal-style rotor with a single dual-piston caliper on the rear. ABS functionality is dealt with by a Nissen ABS unit, for which there is no switch to turn it off – something that the average road user probably wouldn’t want to do anyway. The brakes do lack initial feel – swopping them for high-performance sintered brake pads might be something to consider. The Z900 sports 41mm inverted front forks and a horizontal back-link shock from KYB. the rear shock configuration, says Kawasaki, was chosen for improved mass centralisation and heat management. Both the front and rear suspension are adjustable for rebound and preload. The suspension was somewhat softer than I had expected, which is both a good and a bad thing: it absorbs the worst of the bumps encountered during everyday riding, but if you want to routinely ride the bike hard and fast, you might want to consider heavier-duty oil for the front shocks. That said, handling in the twisties is still more than adequate. The stiff chassis matches the engine characteristics very well, and despite its stability on straights, the Z is surprising nimble in corners. The big question, of course, is how does it perform? This was perhaps the biggest single surprise the Z900 had up its sleeve. Peak torque is developed a 7700 RPM, but a quick look at a dyno graph shows that the torque curve is very flat, which means that the bulk of it is available almost from the get-go. With 92kW on tap in its light body the Z900 is definitely no slouch, and the lack of traction control means that it can be as much a hooligan bike as a sensible commuter. Regular readers will know that I value versatility in bikes, and the Z900 impressed me by being a very good all-round package without feeling that it compromises in any field. The lack of weather protection means that you probably won’t want to do high-speed touring with it, but the few other niggles can all be worked around. The bottom line is that if you are looking for a bike that can serve as a commuter during the week and carve up the twisties or double as a track bike over weekends, this may well be it.